Persistence Market Research (PMR), in its recent study on the multiple orifice flow control valve market, offers a detailed value-volume analysis of the multiple orifice flow control valve market on the basis of various segments such as valve diameter, operation, end use, and region. In terms of valve diameter, the 12” - 24” multiple orifice flow control valves segment is projected to be a lucrative segment in terms of growth opportunities, and these types of multiple orifice flow control valves are considered to be the most commonly applied among end-use industries. There has been significant growth in various end-use verticals due to the expanding oil & gas, chemical & petrochemical, and energy & power industries that are outperforming global trade growth. Further, the growth of the wastewater industry is also positively driving the multiple orifice flow control valve market. From a macroeconomic point of view, a positive outlook for end-use industries will create opportunities for multiple orifice flow control valve manufacturers around the world. The multiple orifice flow control valve market report covers market analysis through basis point analysis (BPS), absolute dollar opportunity index, market attractiveness analysis, and Y-o-Y growth. The volume analysis for the multiple orifice flow control valve market has been considered in units (number of multiple orifice flow control valves for the current base year), covering data for the historical period 2013–2017 and forecast for 2018–2028, with 2017 as the base year. This global multiple orifice flow control valve market report consists of around 19 sections that elaborate on the market numbers in terms of volume in units and value in US$, at regional and global levels. The first section of the global multiple orifice flow control valve market report covers an executive summary that highlights the key trends that are being witnessed in the global multiple orifice flow control valve market from the manufacturers’ side as well as consumers’ side. The next section covers the global multiple orifice flow control valve market introduction, including the taxonomy by valve diameter, operation, and end use; definitions of the segments considered; key success factors to the market; and other information relevant to the global multiple orifice flow control valve market. In the next section of the global multiple orifice flow control valve market report, we have included market viewpoints that include macroeconomic factors, forecast factors, and value chain analysis, along with a list of raw material suppliers, and multiple orifice flow control valve manufacturers, distributors, and end users. This section also covers the market dynamics, which includes several drivers responsible for the growth of the market, restraining factors, and opportunities in the market, as well as several trends with respect to global as well as regional markets. The successive section of the global multiple orifice flow control valve market report includes a global industry analysis by volume and value, along with pricing analysis for North America, Latin America, Europe, South Asia, East Asia, Oceania, and the Middle East & Africa, with a weighted average price for every region and product type segment. The next section of the global multiple orifice flow control valve market report includes a qualitative and quantitative analysis of the multiple orifice flow control valve market by every segment considered. The report also includes an additional section with detailed analysis of the market for three emerging countries - China, India, and Indonesia. This multiple orifice flow control valve market report focuses on analysing the market opportunities and getting a detailed understanding of the multiple orifice flow control valve market. The multiple orifice flow control valve market report elaborates on the regional analysis, market dynamics, market intensity, market structure, and competition landscape of the multiple orifice flow control valve market for the next ten years, i.e. 2018-2028. Each section of the multiple orifice flow control valve market report includes a qualitative and quantitative assessment of the market on the basis of historical data or developments, and facts and key opinions collected from various end-use industry participants through primary interviews, annual reports, newsletters, press releases, etc. The report on the global multiple orifice flow control valve market studies some of the major players in the multiple orifice flow control valve market, such as Schlumberger Limited, Parker Hannifin, Emerson Electric Co., Baker Hughes (GE), KUBOTA Corporation, IMI Plc., Metso Corporation, Flowserve Corporation, Kurimoto, Ltd., Watts Water Technologies, Inc., and Azbil Corporation, among others. The initial stage of the research study includes the formulation of assumptions, which are necessary for primary and secondary research. Further stages of research involved the triangulation of the data collected from these two approaches. To analyse the global market trends and opportunities for multiple orifice flow control valve manufacturers, the market has been segmented on the basis of valve diameter, operation, end-use industry, and region. For the analysis of consumption, we have considered FY 2017 as the base year. Basic data was collected from manufacturers’ annual reports, newsletters, public reports published by governments, valve manufacturing associations & organisations, private agencies, World Bank’s sources, etc. For the final analysis of the market data, we considered demand-side as well as supply-side drivers and trends in various regional markets. We have forecasted the market data on the basis of key developments, regional trends, and the production-consumption scenario of the multiple orifice flow control valve market. For forecasting the market data, we have considered historic data for the period of 2013-2017. The global multiple orifice flow control valve market was valued at around US$ 299.8 Mn in 2017, and is estimated to grow at a 2.4% CAGR over 2018–2028. In terms of unit sales, East Asia and South Asia are expected to register relatively high value and volume growth in the multiple orifice flow control valve market throughout the forecast period. The robust growth of industries such as oil & gas, chemical processing, energy & power generation, and water & wastewater is the key factor responsible for the growth of the multiple orifice flow control valve market. These industries in countries such as the U.S., China, India, and other Asian countries are the key driving forces for the growth of the multiple orifice flow control valve market. Increasing automation and digitalization, and the rising need for remote monitoring applications have improved the demand for smart multiple orifice flow control valves that help in improving durability and minimizing product loss. China, India, Indonesia, and the Latin American regions are picking up in the multiple orifice flow control valve market, owing to the growing number of pipeline projects and robust outlook of various industries in these regions. Valves are commonly used in regulating the production and flow of important gases, steam, and liquid over long distances. Damage in old valves can lead to leakages and intrusion of external agents, resulting in corrosion, loss of material, and added pollution to the environment. The replacement of aged multiple orifice flow control valves in industrial applications such as oil & gas, chemicals & petrochemicals, energy & power, and water & wastewater are mandatory. The demand for the replacement of old multiple orifice flow control valves is driven from refineries, gas distribution, and other industrial process companies that are switching to new high-strength multiple orifice flow control valve products. Multiple orifice flow control valves that are made from steel and cast & wrought iron are the traditional valves material types, primarily used in material transportation, especially in the oil & gas sector. These are being replaced by carbon steel and corrosion-resistant alloy multiple orifice flow control valves. Coping up with the economic slowdown of the oil & gas industry is expected to increase the demand for multiple orifice flow control valves across the globe during the forecast period. Growing urbanization and industrialization not only increases the need for fresh water, but also gives rise to poor wastewater practices, which leads to water pollution and the contamination of drinking water. Such practices have led governments to take up initiatives and introduce strict norms for better wastewater management to reduce water pollution. This will be implemented by creating a strong collection system network of sewers and industrial wastewater collection systems, where multiple orifice flow control valves are installed. Thus, increased wastewater management activities, in both, industrial and municipal sectors, are expected to increase the demand for multiple orifice flow control valves during the forecast period. According to USAID (the United States Agency for International Development), more than 2.1 Bn people don’t have access to safe drinking water, and around 4.4 Bn people lack access to sanitation. With rapid growth in developing countries such as China, India, and others, increased spending on wastewater management is being witnessed, which is expected to drive the growth of the multiple orifice flow control valve market. Governments in India & China are enforcing that industrial wastewater be recycled after industrial use. Thus, increased spending on water management and growing government initiatives are indirectly expected to drive the growth of the multiple orifice flow control valve market over the forecast period. Top companies operating in the multiple orifice flow control valve market are Schlumberger Limited, Parker Hannifin, Emerson Electric Co., Baker Hughes (GE), KUBOTA Corporation, IMI Plc., Metso Corporation, Flowserve Corporation, Kurimoto, Ltd., Watts Water Technologies, Inc., and Azbil Corporation, among others. A majority of these players are investing in orifice technologies and creating orifice plates with new materials with automation solutions for monitoring applications. The competitive pricing of multiple orifice flow control valves by regional players is a key challenge for global players to enter into developing markets. 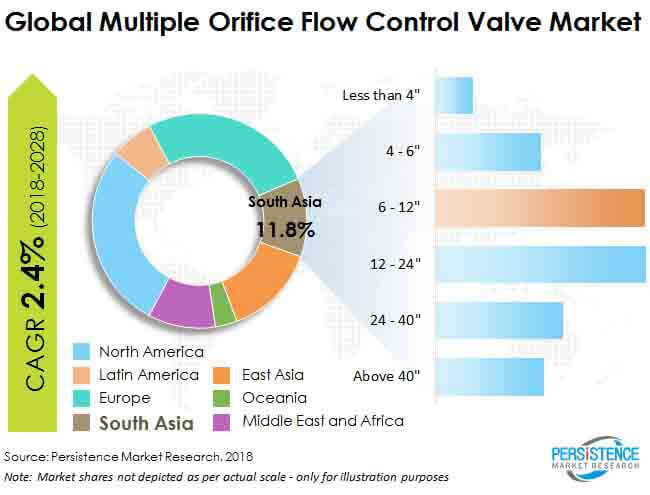 Setting up new production units in India, China, ASEAN, and Latin American regions will drive the revenue growth of the global multiple orifice flow control valve market. The multiple orifice flow control valve market report is designed to provide relevant information regarding these players, and also about the key strategies that they have adopted.